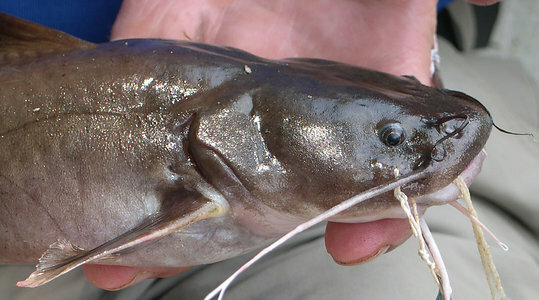 This new family (Lacantuniidae), genus and species of catfish, Lacantunia enigmatica, was recently described from the Río Usumacinta basin of Chiapas, México. This odd siluriform represents an ancient group, perhaps of early Tertiary age or older, that adds another biogeographic puzzle to the historically complex Mesoamerican biota. Rodiles-Hernández, R., D. A. Hendrickson, J. G. Lundberg, and J. M. Humphries. 2005. Lacantunia enigmatica (Teleostei: Siluriformes) a new and phylogenetically puzzling freshwater fish from Mesoamerica. Zootaxa 1000:1-24. Free fulltext article (pdf). Catfish Bones: Lacantunia. Anatomy and illustrations. Digimorph: Lacantunia enigmatica. 2D and 3D visualizations of internal structure. Page: Tree of Life Lacantuniidae Rodiles-Hernández, Hendrickson, and Lundberg 2005. Lacantunia enigmatica Rodiles-Hernández, Hendrickson, and Lundberg 2005. Chiapas Catfish. Authored by John G. Lundberg. The TEXT of this page is licensed under the Creative Commons Attribution-NonCommercial-ShareAlike License - Version 3.0. Note that images and other media featured on this page are each governed by their own license, and they may or may not be available for reuse. Click on an image or a media link to access the media data window, which provides the relevant licensing information. For the general terms and conditions of ToL material reuse and redistribution, please see the Tree of Life Copyright Policies.